An unusual metal for graphene-based electronics — a highway for electrons? Figure 1: TEM images of Rh on multi-walled CNTs (a) pristine and (b) oxygen plasma treated (nominal evaporation 1 Å of Rh). (c) Formation of small ordered fullerene-like protrusions attached to Rh particles. 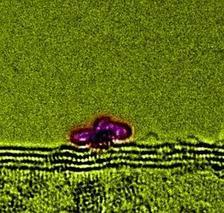 Figure 2: (Above) single Rh atom bonded to a vacancy-O2 defect. The ketone bonded oxygen forms a C-O-Rh bridge, while the etherbonded oxygen is deflected away with dilated bonds. (Below) comparison of the C 1s core level XPS spectrum recorded on plasma functionalized CNTs and coated plasma functionalized CNTs with a nominal amount of 5 Å Rh. Published as: “Study of the Interface between Rhodium and Carbon Nanotubes” ACS Nano 4, 1680 – 1686 (2010). Carbon nanoelectronics require the development of reproducible, high-quality ohmic contacts between carbon nanomaterials and their contact electrodes. The hunt is on for new candidate metals. We have followed the interface formation between rhodium and carbon nanotubes using X-ray photoelectron spectroscopy at 3.5 keV photon energy in combination with high-resolution transmission electron microscopy. Rh nucleates at defect sites whether initially present or induced by oxygen plasma treatment. Experimental results compared to density functional theory calculations show that Rh strongly interacts with the nanotube surface and is less sensitive to the presence of oxygen than other metals that form ohmic nanotube contacts. Due to their high current carrying capacity (in excess of 109 A/cm2) , carbon nanotubes (CNTs) have been investigated as an alternative to the copper interconnects used in conventional silicon-based electronics. Their optimal integration in actual devices remains a key challenge; the reduction of dimensions leads to electrical contacts whose performance depends on the contact formation chemistry. Experimental results and calculations identify Ti and Pd as the best candidates, superior to conventional metals . However, the amount of oxygen present in the initial Ti surface layer on the CNT crucially affects the Ti-nanotube interaction . Indeed, the first deposited Ti atoms preferentially form Ti-O bonds, strongly reducing the interaction between the Ti and the nanotube. Once all oxygen is consumed the excess Ti forms Ti-C bonds with strong interaction as deduced from the large charge transfer observed in the experiment. Therefore, the quality of the Ti-CNT electrical contacts is strongly influenced by the vacuum conditions under which they were formed and the amount of oxygen on the CNT surface — that is, the initial CNT purity. This may explain the wide discrepancy seen in the transport behaviour of Ti-nanotube contacts reported in the literature. Only oxygen at the Ti-nanotube interface matters. Later oxidation of the Ti surface is not likely to affect the contact properties. Nevertheless, this initial oxygen sensitivity reduces the potential of Ti for use in nanotube contacts. Recent studies have shown that Rh is capable of forming highquality electrical contacts . Therefore, it is important to understand the interaction between the metal and the CNT surface in detail. To examine Rh-CNT interface formation, samples were prepared by in-situ electron beam evaporation of Rh onto both untreated “as-grown” CNTs and oxygen plasma treated CNTs. Transmission electron microscopy (TEM) images show that while Rh forms clusters on both the untreated and oxygen plasma treated CNTs, better cluster dispersion is obtained for the latter sample (Fig. 1a,b). This suggests that plasma treatment of the CNT surface creates dispersed oxidized vacancies which act as nucleation sites for the cluster formation, thereby reducing the size of the Rh clusters and increasing the overall surface coverage. 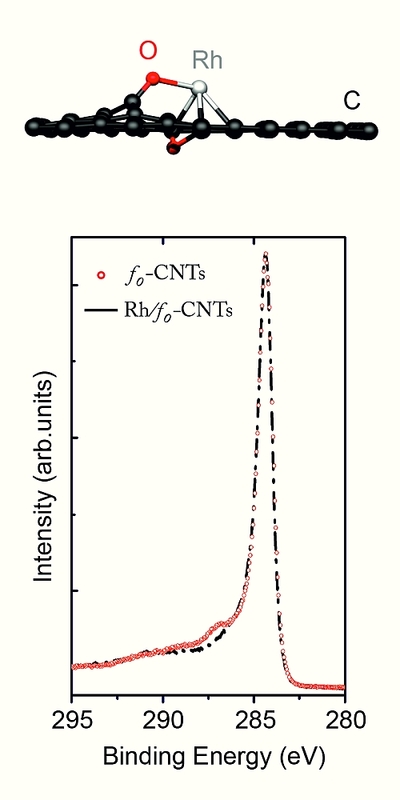 An amorphous layer on the pristine CNTs in the regions surrounding the Rh particles (Fig. 1a) shows fullerenelike protrusions attached to Rh particles (Fig. 1c). 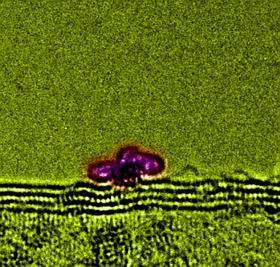 We suspect these are formed through local ordering induced by the TEM electron beam, but they nonetheless raise the interesting possibility of Rh as a catalyst for nanotube growth. X-ray photoelectron spectroscopy (XPS) measurements performed at the BW2 beamline using a photon energy of 3.5 keV allowed elemental and chemical characterization of the Rh/CNT interface [5-7]. At this comparatively high photon energy, the escape depth of the primary photoelectrons contributing to the C 1s peak is about 50 Å,  allowing the characterization of the interface for a wide range of Rh coating thicknesses respectively cluster sizes. The C 1s XPS spectrum recorded before and after evaporation of a nominal amount of 1 Å of Rh onto pristine and plasma treated CNTs showed no additional structures, suggesting that no strong Rh-C bonds were formed. However, for plasma treated CNTs the relative intensity of the C 1s satellite peaks due to photoelectrons from carbon atoms bound to oxo-groups grafted at the CNT surface is reduced after Rh evaporation (Fig. 2). Two effects can contribute to this: i) photoelectrons emitted from C atoms beneath the Rh clusters will experience inelastic scattering when passing through the metal, and thus no longer contribute to the C 1s main peak; also, if Rh selectively covers oxygen-rich areas, intensity from oxygen-related C 1s satellite peaks will be selectively reduced. ii) O-Rh bonds may form at the expense of C-O bonds. C-O-Rh bonding will change the screening of the C-O bonds thereby changing the binding energy of their C 1s levels. The chemically shifted component in the O 1s spectrum is consistent with a strong Rh-O interaction and we turned to density functional theory calculations to examine this further. They show that a single Rh atom binds to the ketone-bonded oxygen atom of an oxygenated vacancy forming a Rh-O-C bridge, dilating all C-O bonds by ~5% (see Fig. 2). If the structure is modified so that Rh displaces the ether-bonded oxygen out of the vacancy, the resulting relaxed structure is only 0.67 eV less stable than the ground state structure described above (i.e. still more stable than a Rh atom and an oxygenated vacancy separated on the carbon surface). This is not such a high energetic cost and is lower than for other metals we have examined. In the presence of larger Rh clusters oxygen scavenging from oxygenated vacancies could thus easily become favourable. While further calculations show that an O2 molecule will bind to a Rh atom on a carbon surface, the binding energy is much weaker compared to Ti (2.71 eV per O2 molecule vs. 8.59 eV). Hence, we expect Rh to be less oxygen sensitive than Ti, especially once clustered. The current work is valuable in that it identifies Rh as a potential candidate for ohmic contacts with CNTs that should be relatively oxidation insensitive compared to other metals currently under consideration. However, it also shows the power of combining high-energy XPS with electron microscopy and theoretical modelling to unravel the atomic processes which dominate interface formation, and ultimately device behaviour. Highresolution spectroscopic studies using XPS with hard X-ray excitation at high-brilliance synchrotron sources may gain importance as an analytical tool not only for carbon nanoelectronics but in nanoscale device physics in general. B.Q. Wei, R. Vajtai, and P.M. Ajayan, "Reliability and current carrying capacity of carbon nanotubes", Appl. Phys. Lett., 79, 1172-1174 (2001). N. Nemec, D. Tomanek, and G. Cuniberti, "Contact Dependence of Carrier Injection in Carbon Nanotubes: An ab initio Study", Phys. Rev. Lett. 96, 076802-2 (2006). A. Felten, I. Suarez-Martinez, X. Ke, G. Van Tendeloo, J. Ghijsen, J-J. Pireaux, W. Drube, C. Bittencourt, and C. P. Ewels, "The Role of Oxygen at the Interface between Titanium and Carbon Nanotubes", ChemPhysChem 10, 1799-1804 (2009). W. Kim, A. Javey, R. Tu, J. Cao, Q. Wang, and H. Dai, "Electrical Contacts to Carbon Nanotubes down to 1 nm in Diameter", Appl. Phys. Lett. 87, 173101-3 (2005). W. Drube, H. Schulte-Schrepping, H.-G. Schmidt, R. Treusch, and G. Materlik, "Design and Performance of the High-flux/High-brightness X-ray Wiggler Beamline BW2 at HASYLAB", Rev. Sci. Instrum. 66, 1668-1670 (1995). H. Schulte-Schrepping, J. Heuer, and B. Hukelmann, "Adaptive indirectly Cooled Monochromator Crystals at HASYLAB", J. Synchrotron Radiat. 5, 682-684 (1998). W. Drube, T.M Grehk, R. Treusch, and G. Materlik, "Tunable high-energy X-ray Photoemission", J. Electron Spectrosc. 88, 683-687 (1998). Surface analysis by Auger and X-ray photoelectron spectroscopy"; Briggs D., Grant J.T., Eds. ; IM Publications: Chichester, 2003.